The dredging of the mouth of the Saco River hit pockets of wood that's now drawing beachcombers and crafters in search of treasures. SACO — People are flocking to the beach in Saco to check out an unusually large amount of driftwood, an unexpected byproduct of a sand replenishment effort. The Army Corps of Engineers embarked on the second phase of a dredging project in the Saco River in January. Sand dredged from the mouth of the river is being transported to the Saco shoreline, an area vulnerable to erosion. Tim Dugan, spokesman for the Army Corps’ New England District, said the dredge hit pockets of woody material more extensive than what was shown in prior sampling, leaving an unexpected amount of wood on the beach. Dugan said the Army Corps is working with federal and state officials as well as the city of Saco and other local agencies to remove the debris and transport it to Ecomaine in Portland. Ecomaine will use it for power generation in its waste-to-energy facility, Dugan said. “It was not an anticipated part of the project,” Saco Public Works Director Patrick Fox said. The Army Corps project manager has received authorization to remove the wood and other debris from the beach and is finalizing a contract and necessary environmental components, including Inland Fish and Wildlife coordination and plover monitoring, Fox said. The cleanup is expected to begin in a week or two, and the city has stressed to Army Corps officials that it needs to be completed by May 1 to ensure the beach is clear when warmer weather hits and people start heading to the seashore. There is no concern about contamination related to the debris, Fox said. This is good news to the many crafters and beachcombers who have been collecting pieces of wood. Rita Shiman said her husband came home from the beach with “the most beautiful piece of driftwood” and she went to Bayview Beach on Wednesday morning to see all the driftwood for herself. “It just goes on all the way down,” she said. 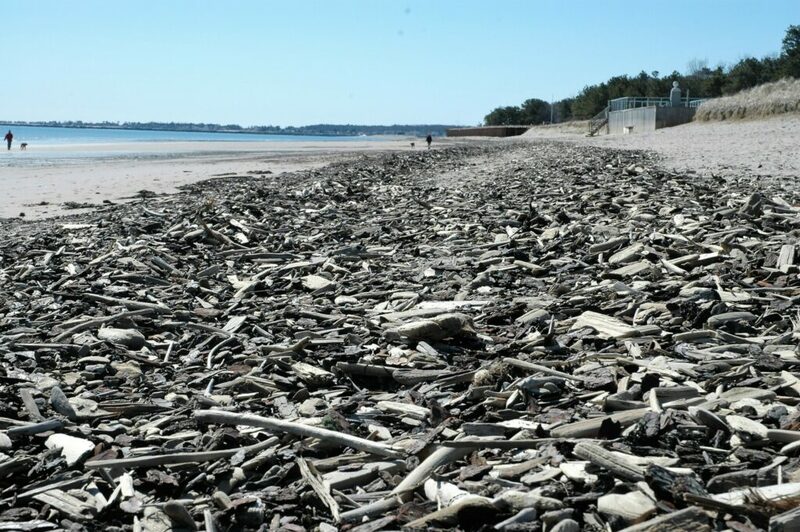 Michelle Murphy of Biddeford decided to go down to Bayview Beach on Wednesday after a friend, Tink Fraschetti, owner of the Mad in Maine, a naturalist boutique in Saco, told her about the driftwood on the beach. “I’ve never seen such an abundance,” Murphy said. The women were collecting wood pieces and planned to use them to make jewelry and other craft projects. The Saco River dredging is expected to be completed by Sunday and dredging near the city centers of Saco and Biddeford is scheduled to be completed by April 10.